Will Human Dreams of Immortality Come True Through Jellyfish Research? 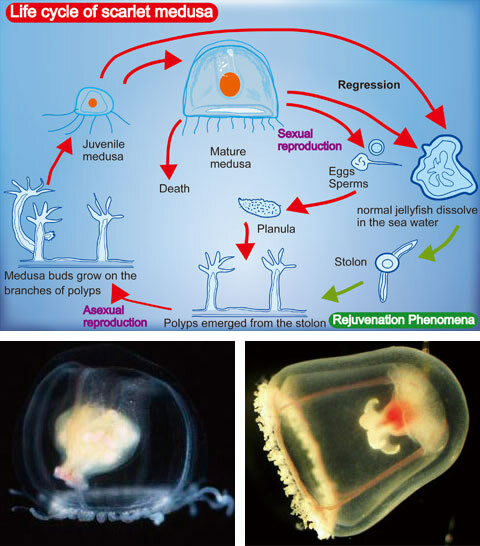 Biological and life science studies of immortal and ephemeral jellyfishes. After the publication of a paper announcing the first ever achievement of ten consecutive rejuvenations of the Jellyfish species Turritopsis spp. in laboratory conditions, various subsequent biological studies were carried out. These included further successful records of rejuvenation, as well as a public exhibition of the jellyfish at Kyoto University’s Shirahama Aquarium. It is anticipated that the jellyfish’s ability to rejuvenate will be further explored, mainly through genetic and molecular approaches, and that in the future, the results of those studies could be applied to make the long-held human dream of rejuvenation a possibility. In contrast, a special research project is being undertaken for genetic and molecular studies on the parallel evolution of a very short-lived species of jellyfish, the bivalve-inhabiting hydrozoan Eugymnanthea japonica Kubota, found in the Pacific and Atlantic Oceans. If life science studies comparing these two tiny jellyfish could provide the key to human immortality, it would be the greatest revolution in the evolutionary history of the Earth, heralding a complete, and highly beneficial, change in our way of life and social communities.